So many of you were kind enough to email me and comment with encouragement for my first Blessings Unlimited party, that I thought I'd share some pictures today. I'll save the info. on the company for another day....Today, it's all about eye candy! 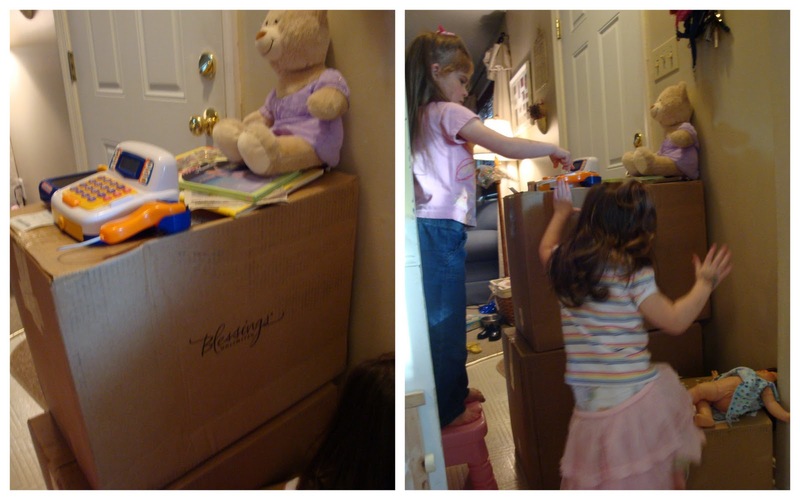 Before I even opened my boxes of "loot," some people had already claimed the packages and made their own storefront. They abandoned the shop when I asked for their commercial license, but it's just as well, because it was their bedtime. I waited until the house was quiet to unpack all my new pretties and to set things up for the party. Those cute little blocks are called "Blessings Blocks" and I was delighted that they came with a booklet showing you how to spell out all sorts of words with the different colors, letters, and decorative accents. The Nester used them in several different ways when she hosted her party, and they're probably one of my favorite things! I used my dining room table to display most of my products. I used some extra drop cloths, and I layered books underneath scraps of burlap to give some of the items more height. Want to see more pretties? This message board is actually a cutting board as well, and it comes with the easel! I love that Blessings Unlimited even has super cute packs of cards you can purchase for any occassion! And what good would a party be without food?! My Sunday Cake was the main attraction for the Saturday night party. I made homemade Chocolate Chip Coffee Cake for Tuesday morning. Both received good reviews. If you notice that small children are conspicuously absent from the photos, that's because I hired a fabulous sitter to keep them out of my hair entertain them on Saturday night. The girls were enchanted, and I didn't have to stress. I didn't have a huge turnout to either party, but I did make some sales, and I earned $135 in free product since I was technically the hostess! I don't want to keep blathering on, but I did want to share some photos from my very first Girls' Get-Togethers. I am hoping to have my own website soon. When I launch that, I'll plan another post to tell you how I got the harebrained to open a home business! Thanks again to each of you who commented and emailed me to wish me well. I appreciate your support and encouragement...more than you know! I'm glad it went well - everything looks gorgeous! Love the message/cutting board! And Congrats on the $135 in free stuff! Glad it went well. I'm so glad it went well. I'll be eager to hear the story of why you decided to jump into a home business. By the way, I think it was brilliant of you to use drop cloths and burlap as table coverings! You go, girl! 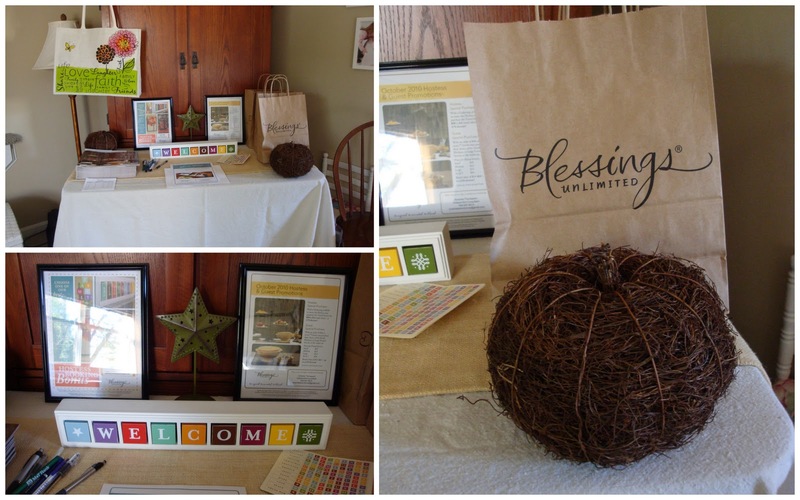 glad it went well-everything looks great-love how you used the books with burlap on the tables-great idea! They have some really nice products! Nice job setting up, and congrats on your new venture! Those are really nice items they sell. I would of come if I lived close by! Everything looked so nice! Glad it went well! The cake looks delicious! Too bad you live so far from me! everything looks great!! Glad it was a success - can't wait to see/hear more about it! Congrats on your new venture! Look forward to hearing more about it. Everything looks great! So many cute things! I would give my big toe for a piece of that cake right now! Congrats on earning free stuff too! YEA! Amanda that is awesome! I know it was a lot of work putting everything together. That's great to make some money and have the opportunity for future success ... May your business be blessed! Looks like a success. I've never heard of Blessings Unlimited, but it looks like some neat things. I made word blocks that really remind me of those (but mine are black). I'm planning to make them in bulk for gifts this year because everyone loves them. Such adorable things in this post! I especialy love the welcome sign and the teapot. I love that message/cutting board. It looks like Blessings Unlimited has great products. What will you get with you $135? ?